Family – Page 5 – wife. mother. awesome girl. Every week I get an email from MapMyRide with my weekly training summary. It’s almost never totally devoid of some form of activity – I walk for part of my commute every day so at the very least I’ve put 5 miles under my belt each week. The only times it’s completely blank is if I have been on vacation, like the time my husband and I vacationed in Seattle with two of our very good friends. I did a LOT of walking that week – but didn’t bother to track it because I’m ON VACATION. But it definitely serves as a reminder that I’m not out riding (or hiking or walking) as much as I want to be. Desire is good. Obsession is not. You can’t forsake all else for the pursuit of a selfish desire. As much as you need time to do your own thing, you have others who need you to be there with them. My kids, my dogs, my husband, my family, my friends, my boss, my subordinates, my peers, the local music scene (I love going to shows) – all need my attention at some level or another. As I’ve said before, it’s all about balance. I say this because I read other cyclists’ blogs and sometimes get wistful at the time they have devoted to their passion. I have to remind myself that not only am I not them, but I’m also (generally) not in the same generational bracket. Most of my group ride partners are around my parent’s ages – and rightfully so. They have raised their kids, they did their time of juggling work and play, and now have more time to just play. They paid their dues and reap the reward. I want to be fit enough to go on long bike rides when I’m in my 50s and 60s and decent clips. The other thing is I am not a morning person and no matter how much I love riding, I loath getting up early to hit the road before it gets too hot and sticky out. There isn’t enough coffee in the world to make me happy about getting up before 9 or 10 am. All that being said – I’m excited to be riding with my son tomorrow morning – a brisk 25 miles together through Bucks County, Pennsylvania. This afternoon will be all about prepping the bikes, getting the hitch loaded on the truck, deciding if I want to ride this on my hybrid (which will match his speed better and be a “better” “workout” ha ha) or my road bike (which will make the ride easier). Laying out our gear, pre-loading the coffee maker, and picking up snacks and drop-ins for our water bottles (it will be cooler but still mid-80s by the end of the ride). Guiding him through his first supported cycling event. 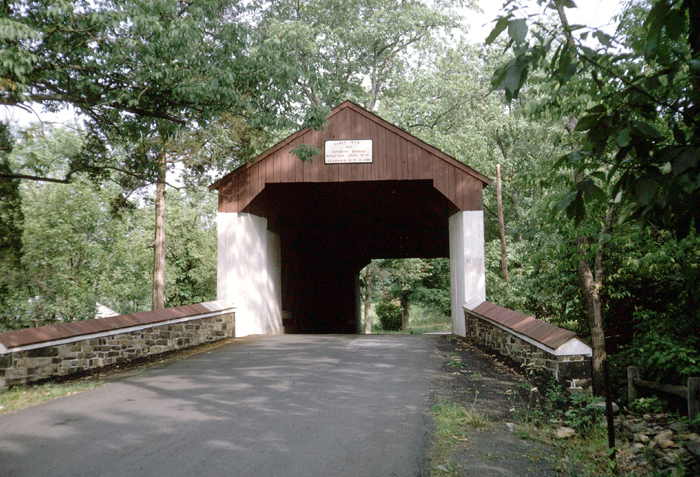 Bucks County is home to only 12 covered bridges still standing.